NOTES: Short run kit with resin, photo-etch and vacuform parts. 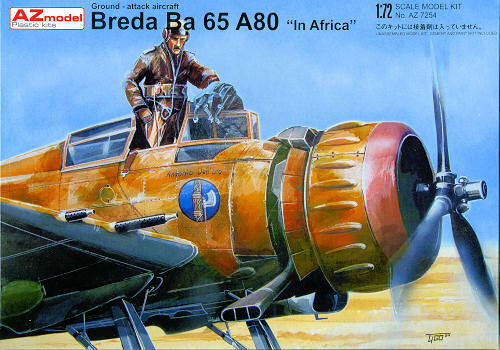 During World War II, the Ba.65 was employed against the British in North Africa. When Italy entered the war in June 1940 about 150 aircraft were reported to be still in service, albeit suffering heavy losses facing the British fighters. Most were either out of service or shot down by February 1941. The aircraft, which had been forcibly kept in service after the failure of the Ba.88 and the poor performances shown by the Caproni Ca.310, was replaced by modified Savoia-Marchetti S.79s or fighters in the dive bomber role. A total of 25 Fiat-powered Ba.65s two-seaters were sold to Iraq in 1938. In the mix, were 22 were equipped with Breda L turrets and two dual control trainers. They saw action against the British. Chile bought 20 Ba.65 (17 single-seaters and three dual control trainers) powered by the Piaggio P.XI C.40 (also a 14K derivative), late in the same year. Portugal purchased 10 Breda equipped with Fiat engines and Breda L Turrets, in November 1939. The Soviet Union received 10 aircraft. 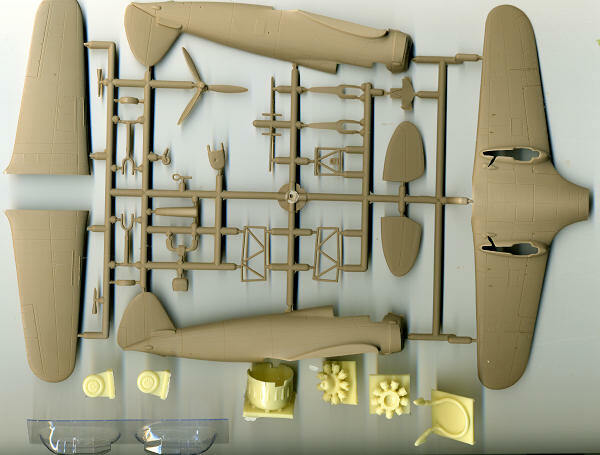 Typical of AZ model's kits, this one is a single sprue with most of the airframe pieces, several resin parts for the engine and wheels, two vacuformed canopies and a photo etch fret for detail items. The plastic pieces are very nicely formed and have a somewhat rough su rface with crisply engraved panel lines. There are ejector towers on several parts and a tad bit of flash. The pilot seat back has both a sink mark on the back and a large ejector tower on the front, requiring some work. Resin is used for the engine cowling, both rows of cylinders, the rather unique exhaust system and the main wheels. Photo etch is used for the harness, engine pushrods, tail plane supports, instrument panel, The lattice work behind the pilot, rudder pedals, and the control surface actuators. The cockpit is made up of a nicely done cage framework that is inserted into the fuselage halves. Landing gear is quite sturdy with optional mud shields. 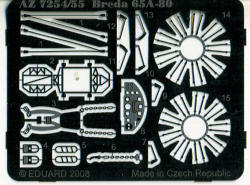 Some small parts like the pitot tube and small landing gear braces will need to be made from stretched sprue. Instructions are a folded sheet with a brief history, parts layout and 17 well drawn construction steps. It also contains a generic paint guide. The back of the box has the camouflage and markings information in full color. Both aircraft are from the same unit, though at different places during 1940. The box art plane is in a basically sand background with light mottling in green. The other is in a light sand with thicker dark green and black mottles. 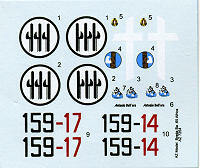 The small decal sheet is nicely printed. Overall, a nice kit that shouldn't give anyone with some short run experience any problems. It should build into a nice representation of a lesser known ground attack type and look very nice on your display shelf. You can get this kit and many other fine kits and accessories at www.greatmodels.com .